DUBOIS – Members of the Community are invited to help support the efforts of THON by attending the Dancer Send-off Dinner and Hair Auction slated for 5:30 p.m. Thursday, Feb. 15, in the student union at Penn State DuBois. This event will feature a spaghetti dinner, a silent auction and a hair auction, during which those in the audience place bids in order to raise enough money for the volunteers to get their hair cut. Each volunteer has set a minimum amount that has to be reached in order for them to lose their locks. Those volunteers include Assistant Professor of Mathematics John Tolle; student Tristan Bressler; THON Dancer Julie Test; and nine-year-old Kendall Lashinsky, daughter of Assistant Director of Enrollment Services Holli Lashinsky. Some of these volunteers will also donate their hair to be used in the creation of wigs for cancer patients. Three campus dancers from DuBois will also be officially sent off to THON weekend at this event. 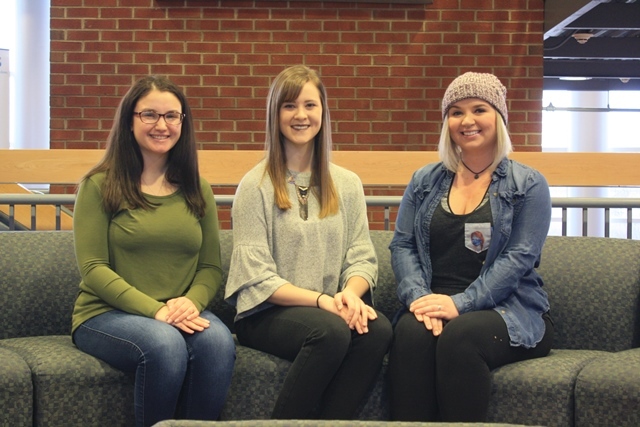 Alaina Shaffer of Clearfield, Brynn Morgan of Grampian and Julia Test of Curwensville will represent DuBois as the Official Campus Dancers during THON 2018. They have been challenged to stay on their feet for 46 hours during the dance marathon at the Bryce Jordan Center, alongside thousands of students from all Penn State Locations. THON is planned for Feb. 16-18. Each year, THON, Penn State’s Dance Marathon, raises millions of dollars for the Four Diamonds Fund. The event’s sole beneficiary and a leader in the fight against pediatric cancer, the Four Diamonds Fund fills in the funding gaps that insurance leaves for the patients it serves, enabling families to focus on caring for their child. Because of large donors like THON, Penn State Hershey Hospital recruits world-class talent to continue innovative research, and to maintain and expand the state-of-the-art Children’s Hospital. The cost to attend this event is $5 per Penn State Student, $15 for a single admission and $25 per couple. All proceeds benefit THON. Those wishing to attend are asked to RSVP online. Or contact Rebecca Pennington at 814-375-4766 or rxs163@psu.edu.